At the end of last year, we got word about many of Pelikan’s planned offerings for 2015. Of course, until a pen is announced, such news is merely rumor. Most of those proposed pens have indeed materialized and thus far in 2015 we have been given the M200 Café Crème, M805 Anthracite Stresemann, M805 Clear Demonstrator, M205 Amethyst Demonstrator, and the M600 Pink. One pen was left on that list that we had yet to see, until today that is. 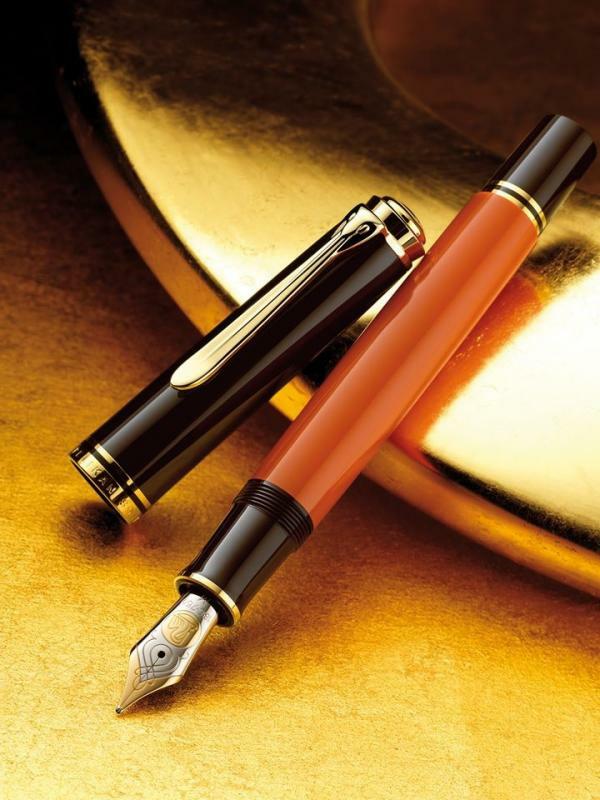 Today the web brought us news of the upcoming Pelikan M800 Burnt Orange. Originally intended to be announced sometime in early August, word has gotten out early thanks to retailers in Italy. While we do not yet have any confirmation from Pelikan themselves, we do have very reliable information from Novelli Pens & Pipes, a well-known and long-standing Italian retailer. There is no official information on Pelikan’s website at the time of this post but Novelli has given us our first glimpse of the Burnt Orange. This is an M800 release meaning that the furniture will be gold-plated in contrast to our last two M805 releases featuring palladium trim. I suspect this will appeal to those who have held off on the recent M805’s out of a preference for gold trim. This pen looks to have a polished orange barrel complimented by a dark brown section, piston knob, and cap. There is a single trim ring at the section and two at the piston knob, all standard fare for an M8xx. The cap has two cap bands, the traditional beak clip, and the cap top logo is 24C gold-plated. The nib will be two-toned 18C-750 gold available in EF, F, M, and B (unsurprisingly). Interestingly, there does not appear to be an ink window from the images we have available which is a bit unusual for Pelikan. It is unclear at this time whether the orange barrel exhibits any translucency which will likely become clearer as more information is released. It is almost certain that this will be a special edition release which means quantities are likely to be limited. We should expect an official announcement from Pelikan sometime in August and the anticipated release of the M800 Burnt Orange is tentatively scheduled for September/October of this year. A ballpoint pen will also be available in this finish. As far as pricing goes, the fountain pen looks to be priced at Pelikan’s standard MSRP of 490 euros (~$545). Novelli is asking 441 euros (~$490) for European customers and 362 euros (~$402) for customers outside of Europe. The asking price for the ballpoint is 297 euros (~$330) in Europe and 243 euros (~$270) outside of the continent. Pre-orders are being accepted at this time. Personally, I think this is a great look for the M800. While I love their striped patterns, this solid orange barrel is very attractive. I don’t regret buying my Stresemann but, had I yet to do so, it would have been difficult for me to decide between the two. I’m sure parallels will be drawn with pens like the Delta Dolcevita or Montblanc Hemingway given the color scheme and those already owning those pens may feel comfortable passing on this release. I do think that a fair number of Pelikan fans will yet again be disappointed to see such an attractive finish come to the M8xx line, a pen sized too large for the comfort of many. What is certain is that 2015 will go down in my mind as the best year of new releases that I’ve seen come out of Hannover for some time and I look forward to seeing how Pelikan intends to keep up this momentum. What are your thoughts on the Burnt Orange M800? Good looking pen. It is a nice departure for the M8xx line from the striped pens. I would probably choose a Stressemann over this if I were in the market for something in this line and both were available to me though. I’m a sucker for orange and yellow pens. This may be too good for me to pass up. This looks like their Indian Summer to me, without the silver leaves. I agree that the M640 Indian Summer has a lot in common with the Burnt Orange. Still, the M640’s orange varied from lighter in the center to darker on either end of the barrel. I admire the Indian Summer but there is something about this Burnt Orange that really has me captivated the more I look at it. Certainly does resemble my Mont Blanc Hemingway, a color combination that is very pretty. I am one of those with paws where most people have hands, and all I use is the M800 or M1000 size. Thanks to you, Joshua, for getting the info out to us quickly. You’re welcome but I have to give credit to new FPN member amerigo_i who brought this information to light on FPN in this thread. I like that the solid color is something a bit different. Still, I bet it would look great as a striped pattern too. I really like that color orange. Beautiful pen. The pattern taken from Parker. I will try to buy it. Thanks to Joshua for the information. With great pleasure I read your page. You’re welcome. I think this will be on lot of people’s “to buy” list. They appear sold out at this point. Did you end up buying one? The color of this pen is amazing now that I have it in hand. Pictures don’t do it justice.